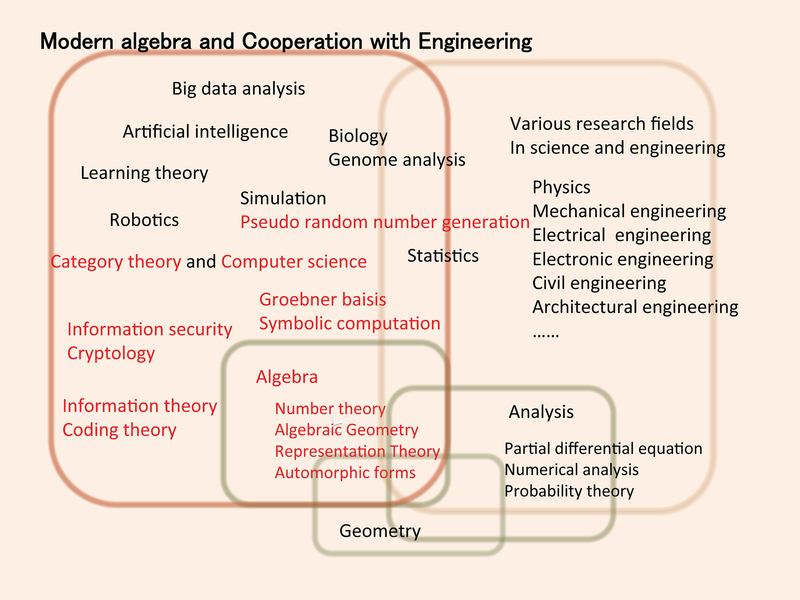 To research and develop algebra itself and algebra based engineering, also to find new engineering fields cooperation with algebra, thereby making a contribution to mathematics and engineering. It is important for mathematics, which has more than 2000 years history for research, to interact with other research fields outside mathematics. Research area of pure mathematics is roughly divided into three parts, algebra, geometry and analysis. One can think that algebra and analysis are two wheels of a cart, via geometry and geometric objects. In its long history, analysis, which treat mainly continuous objects, has been developed in interaction with various engineering technology. On the other hand, algebra, which treat mainly discrete objects, has been started to make interaction with information science, information technology, electrical and mechanical engineering, etc., after 20th century, and produce many useful results and effects which are indispensable for modern human life. Our division based on algebra are going to cooperate with another division “Mathematical modeling and its Mathematical analysis”, and are going to be a basis of science and technology to cooperate with various research areas. And finally, to be a center of research on algebra and algebra based engineering. The division consists of various researchers inside Tokyo University of Science,whose research fields are number theory, arithmetic geometry, algebraic geometry,commutative algebra, representation theory, automorphic forms, algebraic topology, discrete mathematics, combinatorial design, computational mathematics, computer algebra, cryptology, information security, coding theory, and applied algebra. In the past, these researchers have cooperated with each other in the occasion of seminars, workshops and international meetings. As an activity of this division, we pursue further cooperative relationship not only inside the division, but also outside the division, and we are going to produce many cooperative research between pure mathematics and engineering. More precisely, the division consists of three groups for purely mathematical research and three groups for applied research. Pure mathematics groups are managed by holding seminars, workshops and symposiums on algebra, algebraic geometry, number theory, and so on. Engineering groups are also managed bymaking a place for engagement of researchers of pure mathematics and engineering, and by proposing and developing many research plans for both sides, mathematics and engineering. There are three special features of this division. 1) The generations of researchers are widely distributed. 2) They have enough experiences of joint research not only for domestic but also for international. 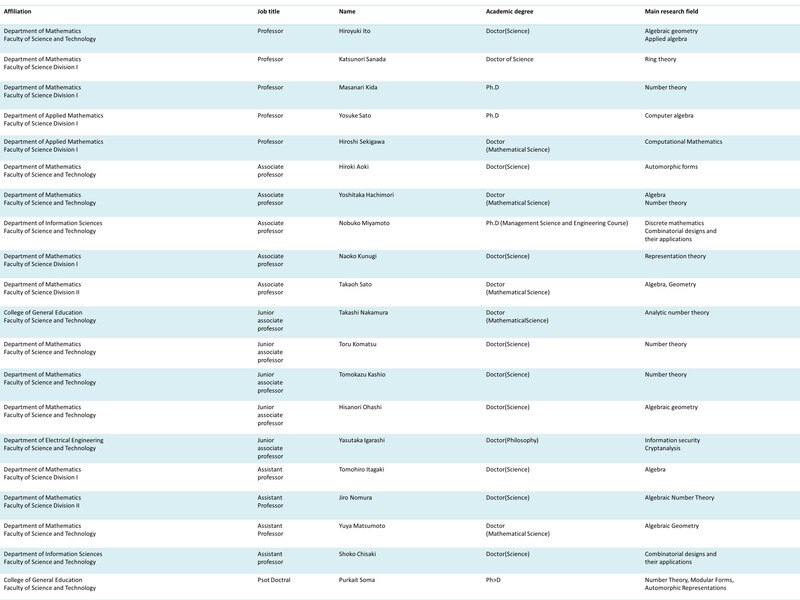 3) The researchers have been managed continuously various seminars and symposiums inside Tokyo University of Science. The first step is to make relationship between person and person in various research fields, which has already done. The second step is expanding the relationship between person and person to person and group. Final step is expanding the relationship to group and group, and developing a new cooperative research fields based on algebra. To make contribution to mathematics and engineering, and to make the center of research on algebra and its applications to engineering. This division do research from purely theoretical mathematics to experimental engineering, and make cooperative environment between mathematicians and researchers in algebra based engineering. Furthermore, the division will contribute to find new cooperative research fields between algebra and engineering which make mathematical innovation.